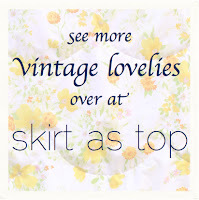 Today’s Vintage May guest is one of my closest bloggy friends! We met in person last month at SNAP and totally bonded over blogging, sewing, chocolate, non-dancing, and Zac Efron. lol just kidding on that last one. Or am I?… haha. Anyways, Kate from See Kate Sew is so awesome it’s almost hard to look straight at her. Kind of like the sun. She was so popular at SNAP, everyone knew who she was! Go Kate! She makes the cutest clothes for herself, too, and has tutorials for TONS of projects. This slip has been on my to-make list for ages. If we have a boy this time, I am totally making one of these! This awesome felt camera was the first project of hers I found, and I’ve been smitten with her and her lovely blog ever since. If I could choose a fashion decade to live in, it would definitely be the sixties! I love the boxy silhouettes, the fabrics and color combinations and Twiggy is one of my favorite fashion icons! 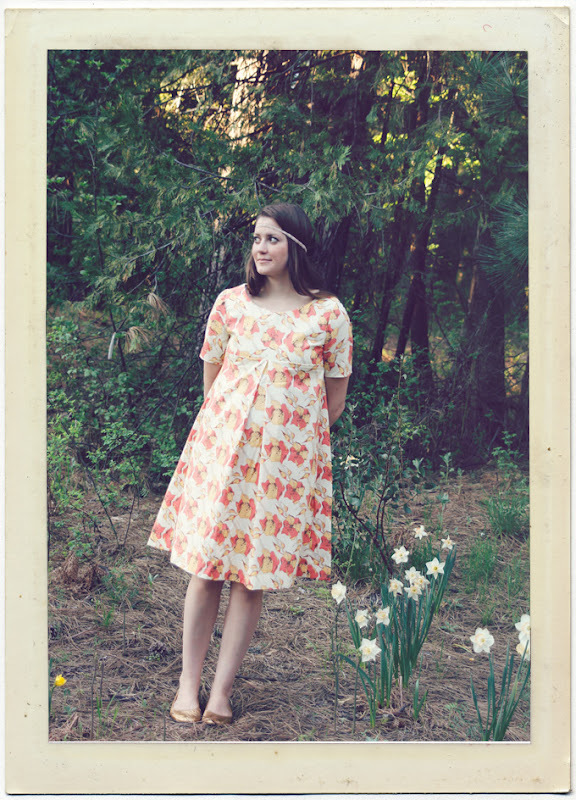 For Vintage May I made this tent style dress with a front pleat feature. I thought the fabric I chose was very 60s, too, with an all-over floral and a yellow/orange/coral palette. To make this dress I used a basic bodice with an empire waistline. I added fullness to the skirt by sewing in two wide gores on the side seams and pleating more fullness at the center front and center back. An orange exposed zipper acts as the closure in the back. I interfaced the bodice to give it more structure. I’m really happy with how it turned out, so carefree and easy to wear! Thanks for having me Jess and Kristin! Thanks, Kate! Love that print! Check out the adorable scalloped yoke tutorial by Hart & Sew over on Skirt as Top! The 60’s were AWESOME!!!! I dream of driving VW Bus from the 60’s…I have the whole thing planned in my head…driving it around the California coast one summer thrifting and going to garage sales….anyways…you are adorable and I love your fabric choice! Thanks Jess!! You are so sweet! I am definitely not as cool as you made me out to be, but so glad we can be real friends!! Thanks again for having me! Vintage May is awesome!! Love everything about this! Kate, you’re darling. Adorable print & great for summer. How was the SNAP conference? Would you recommend it for new bloggers? Haha, I love Kate! We had sewing classes together in college and it was only after we had both graduated we found each other in blog land! Now I need to go through my vintage sheet stash to see what I can cut up, that dress is just too cute. Sweet! I used to make dresses like this for myself in the 90’s as a throwback. Love it Kate! !